Talk about potatoes and we remember The Martian. How can a guy survive for over a year on spuds alone? Come to think of it, these root vegetables are rich in B vitamins, fiber as well as minerals and trace minerals. And before you balk at their carb content-they contain complex carbs which are digested slowly so you feel full longer. Also, this “skinny carb” passes through the intestines like dietary fiber to prevent constipation and other issues. So let us take a look at different ways to prepare potatoes in an easy and healthy manner. Mashed potatoes are the easiest comfort food. Boil and peel the potatoes. Once cooled, mash them with salt, pepper, olive oil, cheese, milk, sour cream, cream cheese, herbs and spices. Think outside the box-be as creative as possible. This is a wonderful dish. Wash and scrub the potatoes with a brush. Dry and place them on a baking sheet. Bake them at 400 F for an hour or until tender. Once cool, cut them in half lengthwise and scoop out the centers. 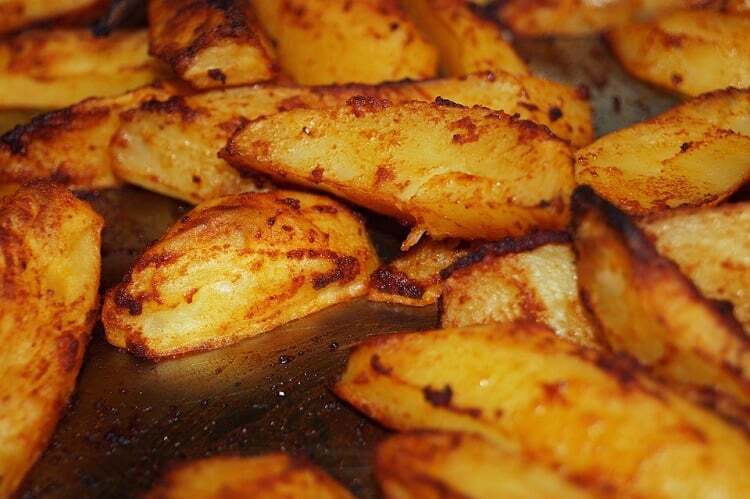 Arrange the potato shells on a baking sheet. In a bowl, combine the potato centers, avocado, jalapenos, milk, sour cream, salt, and pepper. Mix well.Divide this mixture evenly on the potato shells and sprinkle cheese on top. Bake for 20 minutes or until cheese melts. Scrub potatoes clean. Dry, then cut them lengthwise. Toss them with oil to coat evenly. Arrange the potatoes in a single layer on a sheet. Bake for 20 minutes. Turn midway with a spatula and bake for another 10 minutes. Take out the fries in a bowl. Add salt, pepper and sprinkle Romano cheese on top. This is a very easy recipe. Wash the potatoes and cut out a small wedge from each one to let the steam escape. Place in a microwave safe bowl and cook on full power for 10-12 minutes. Use oven mitts to remove the potatoes. Season to taste. Use this potato garlic dip in place of hummus for your vegetables, pita chips and crackers etc. Mash several boiled and peeled potatoes with almonds, lemon juice, olive oil, salt, pepper and vinegar.This is one of the easy potato dishes. In a pan, melt butter then add the flour and whisk briskly to prevent lumps. Add the milk and cook till the sauce thickens. Next, add the cheese, salt and pepper. In a baking pan, add half the sauce, then the potato slices and onions. Top off with remaining sauce. If you want, you can sprinkle some cheese on top. Bake uncovered for an hour or until the potatoes are soft. Transfer the onions and potatoes to a tea towel and squeeze out excess water. Put the dry potatoes and onions in a bowl, add the flour/meal, eggs, salt and pepper. Mix well. Shape the mixture into patties. Press down and flatten to form pancakes. Fry the latkes on a heated girdle. Serve warm with cream/sauce. These are ideal for a BBQ or patio party. This is based on the Guy Fieri recipe. He suggests serving it with garlic-mustard-mayo dip. In a bowl, combine the oil, spices and seasonings. Preheat grill to medium high. Coat the wedges with spice mixture. Grill for 3 minutes on each side. Transfer to a plate and sprinkle cheese. This is one of the easiest ways to prepare potatoes. For the dressing- Dijon mustard, mayonnaise, sour cream, lemon juice, vinegar, herbs (dill, parsley etc), seasonings. Prepare the dressing by mixing all ingredients in a bowl. In another bowl, add potatoes, eggs, celery and onions and mix well. Combine with the dressing ingredients. Chill for an hour before serving. Cook potatoes (8 medium) until al dente. Drain and add milk (6 cups), half and half milk (2 cups), green onions (1/2 cup chopped), sour cream (8 oz), shredded cheddar cheese (1/2 cup), and salt and pepper to taste. In a pan, melt ½ c cup of butter and whisk in ½ cup flour until blended. Add to the potatoes mixture and cook for ½ an hour or until the desired consistency is reached. The next time you are looking for easy ways to prepare potatoes, do give these recipes a try.